On this edition of No Holds Barred, host Eddie Goldman spoke with heavyweight boxers Deontay Wilder and Eric Molina. 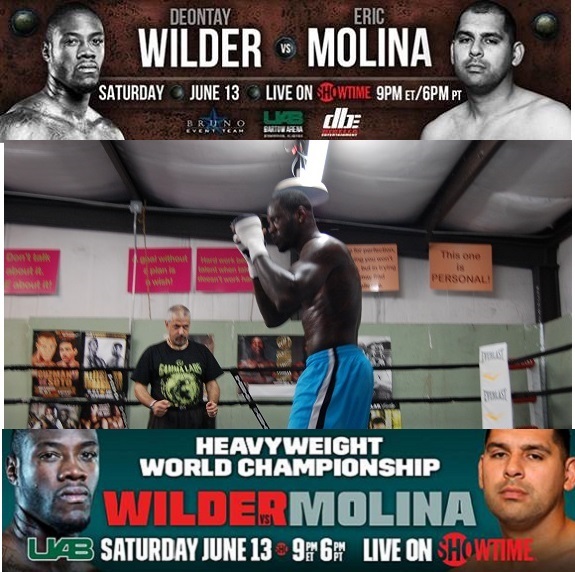 Wilder (33-0, 32 KOs), who holds the WBC heavyweight belt, will face the huge underdog Molina (23-2, 17 KOs) in Birmingham, Alabama, headlining a card which will be televised live in the U.S. on Showtime. We spoke with Deontay Wilder and Eric Molina on a media conference call last Wednesday. While Molina is given almost no chance of defeating Wilder and this fight has been criticized by many, we discuss why these types of fights are typical in boxing, where there is no central governing body. We also discuss the future of the heavyweight division, including the top champion Wladimir Klitschko, undefeated fighters like Tyson Fury and Anthony Joshua, and what appear to be plans to develop Wilder into a major star. We also discuss the resurgence of interest in boxing this year, how several recent televised mismatches have nonetheless drawn good TV ratings in the U.S., why major premium TV networks are essentially acting as promoters, and much more. You can play or download No Holds Barred here and here. If one link doesn't work, please try another. You can also listen to No Holds Barred via Stitcher through iOS or Android devices or on the web, at http://www.stitcher.com/podcast/no-holds-barred-with-eddie-goldman. The PodOmatic Podcast Player for iOS is available for free on the App Store. The No Holds Barred theme song is called "The Heist", which is also available on iTunes by composer Ian Snow. American Top Team. Whether you're a beginner or a champion, train with the champions in Brazilian Jiu-Jitsu, boxing, wrestling, grappling, and mixed martial arts at American Top Team. Check out their web site at AmericanTopTeam.com. Defense Soap, an effective, deep penetrating body soap with natural antifungal, antiviral, and antibacterial soap ingredients. Defense Soap is the best cleansing body soap for men and women athletes who are involved in contact sports such as MMA, wrestling, grappling, jiu-jitsu, and judo, to help their antifungal, anti-ringworm, anti-jock itch strategy. Check out their web site, at DefenseSoap.com.